Waking up the next morning, we needed, of course, to follow up with a ginormous breakfast. I've waxed poetic about the subject before, but for the record let me just state that there ain't no breakfast like a Taiwan breakfast. Period. 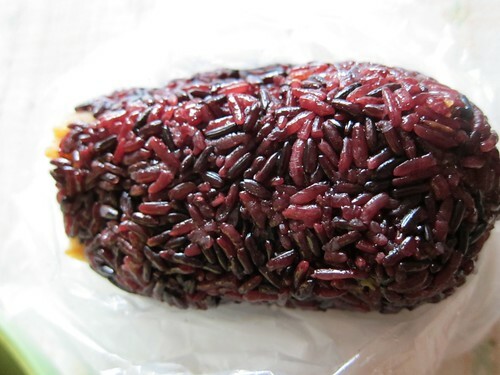 Take for instance, this purple sticky rice roll. You can have a number of yummy fillers, but here we have a Chinese churro, some pickled vegetables, and dried pork floss (just trust me on that last one - it's great). This is freshly made cao bing. 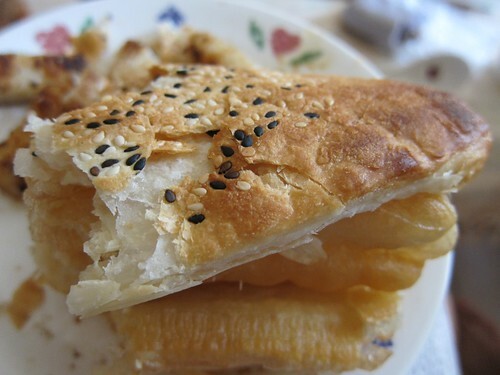 They are flaky pastries with black and white toasted sesame seeds. 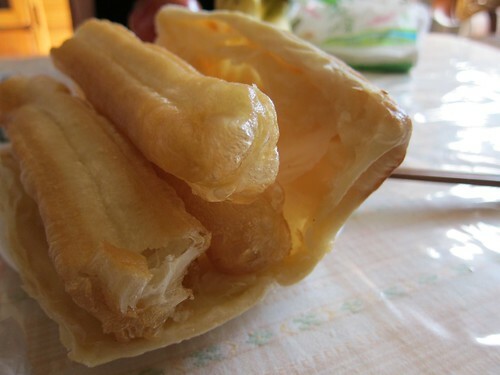 You can eat them with Chinese churros inside for full effect, like so. One of my all time favorites is man tou, which are a very basic steamed bun that has a fluffy and light consistency. 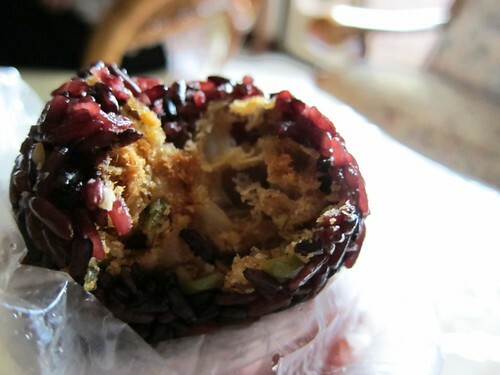 I love the taro ones, which are normally purple in hue and have a sweet taro paste inside. Ahh and then there is the venerable institution that is soy milk. There is the sweet variety, which can be served hot or cold. 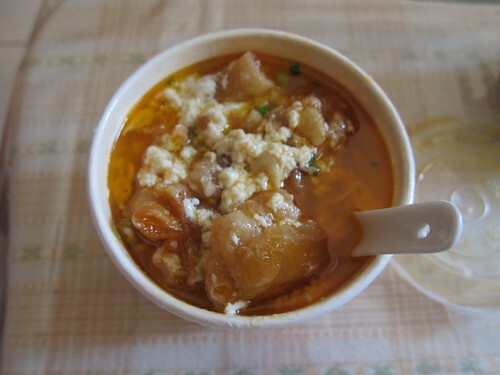 But more amazing is savory soy milk, which comes in a variety of ways but is always piping hot. Below, it is mixed with Chinese churros (are you noticing a pattern here?) and vegetables/condiments to create an almost tofu like porridge. And THIS. My oh my, is this good. 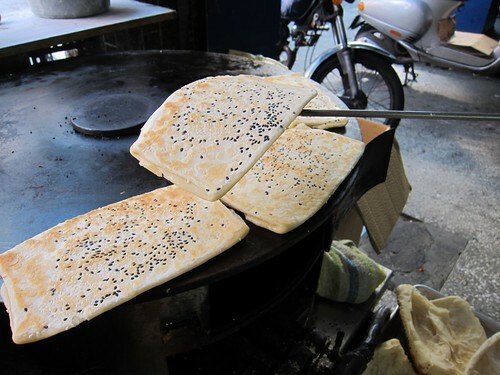 It's like a scallion pancake but more bread-like and with toasted sesame seeds and abundant amounts of black pepper. IT IS SOOO GOOD. While all of the above is street food, not everyone eats out for breakfast everyday. Many people might have a simple and light bowl of congee. 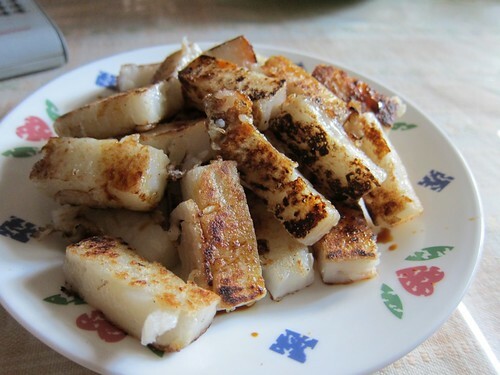 My grandmother prefers homemade turnip cakes, which are pan fried until crispy on the outside and soft and chewy on the inside. Most of this food is not that easy to find stateside unless you go to somewhere like Flushing (which is essentially a microcosm of China in the middle of Queens, New York). 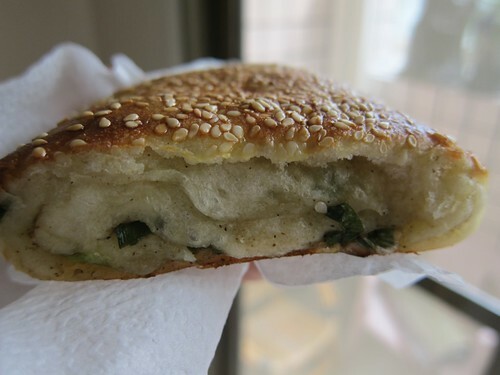 So next time you are in Queens or watching the U.S. Open in Flushing, you could perhaps show a picture of one of these breakfast delights to some random Chinese person off the street, and they can point and guide you to breakfast nirvana. You can thank me later.